Content marketing is certainly a force to be reckoned with. The desperation for companies to digitally reach more people has caused business budgets to stretch to cover content – knowing that it is a fool-proof way to attract, convert and even delight their customers. 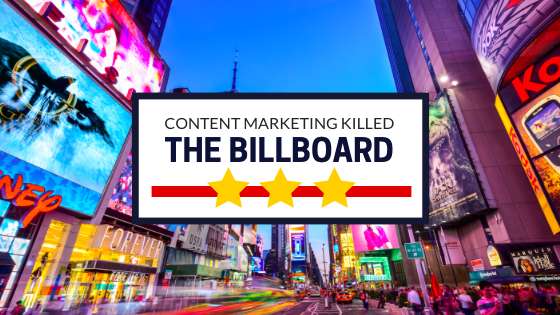 This is why content marketing has killed the billboard star. Billboards, in their unavoidable shove-it-in-your-face cockiness, simply shout out their short (and often overly salesy) message in the hope that potential customers hear (or should we say 'see') them. This is a risky way of trying to capture leads. It almost presumes that customers will actively seek you out and jump in your lead-gen funnel with absolutely no assistance from you as a marketer. Billboard capital of the universe, Times Square (New York), has even swapped to the inbound side of life. In 2011 they traded in their usual Broadway advertisement slot to feature their first social media campaign – boldly paired with Audi. For once, Times Square offered content – information that was useful to an audience, and allowed them to go further with their research by including QR codes and hosting a twitter conversation on the big screen. Suddenly the simple billboard pushing out white-noise nothingness was transformed into a majestic platform of discussion, education and interaction. But how do companies (without a budget of billions of dollars to plaster themselves across Times Square) effectively use content marketing? Content marketing develops trust by offering juicy, fun and educational information that subtly helps prospects come to the conclusion that you – being the wise, generous and helpful company that you are – are the right choice to buy from. Content drives traffic like no other. Seriously, one tweet leading to one blog, that has a fancy CTA, which takes your reader to a well-designed landing page could be how you capture a lead and eventually make a sale. Because you may just ‘score’! Lead scoring is based on how a prospect interacts with your content, and how they move through your nurturing campaigns. Seeing how someone consumes your content can be helpful with understanding what they want. Once you have that piece of information, you can pitch to them and BOOM – you’ve scored yourself a customer! Did you know? 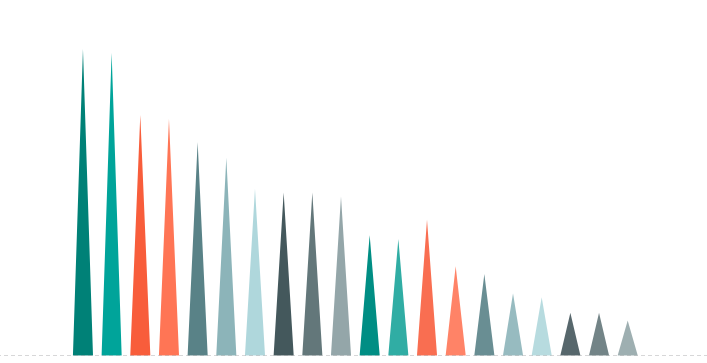 Huge companies with over 1000 employees use (on average) 9 content marketing tactics, but companies with under 10 employees use (on average) 6 content marketing tactics – not a big difference at all! 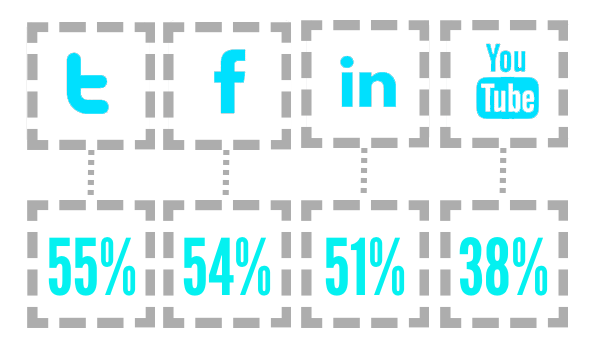 36% of marketers identify producing engaging content as their number one struggle. The key to combating this is to focus on your buyer’s problems. Knowing what they have issues with and what they are looking to find out, or be educated on is often great inspiration for engaging content. Great content can take time, but it is so important to your marketing that you can’t really afford to cut it out. However, you can knock a few hours off by being super organised. A great content calendar will keep you on top of your workload. When sourcing your social media posts, keep an eye out for great content that resonates with you. Save that post as a bookmark so you can use it for a curated content post later on. This one will probably have to be handled by the money men, but if you need some data to convince your boss to stretch his pockets for content, then have a look a these blogging stats, highlighting the incredible ROI of content. Though your content may orbit around the same general theme, you can easily jazz it up and make it look different (and appeal to different people). Even if you are not a designer at heart, here are some simple ways to make your content look fresh, professional and easy on the eye. Money can often be a sensitive issue, especially as marketing is often left out of the business budget. 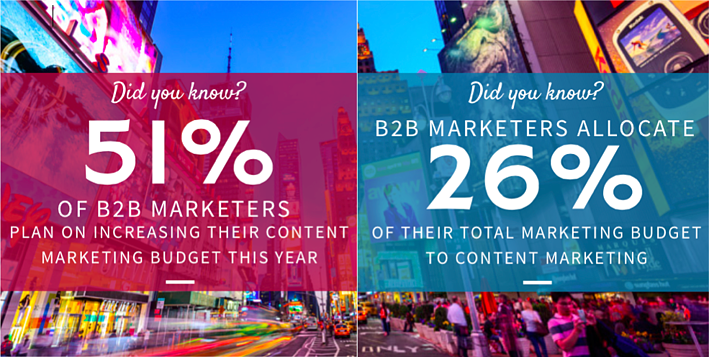 Here are the stats you need to know about to make a case for your content marketing.